I admit that I am a little foodie, but my relationship with Lebanese food is by inheritance. The best thing is that in Madrid, in front of El Retiro Park, there is Shukran, an open-air place where you can try delicacies from Lebanon. 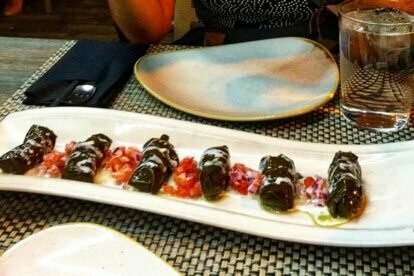 I especially like the vine leaves (warak enab) they prepare here: they are stuffed with feta cheese, mint, citrus, olive oil and the Shukran secret touch. On summers nights, it is ideal to dine or spend the afternoon in this place. It is easy to reach with its excellent location (you can walk there or take the subway), and if you are walking through the Barrio de Salamanca, you can end the tour here with an exquisite menu. The essence of its gastronomy is precisely that — the Mediterranean — so the basic ingredients of its recipes are similar to ours: lots of vegetables, olive oil and meat dishes. You should try the hummus selection and accompany everything with pita bread or falafel. I recommend the kebbe, the manakesh or the fatoush salad and everything that has vegetables. In Madrid, Spanish food is not the only protagonist: the beauty of this city is that you can have a gastronomic sample of very interesting places from around the world. By the way, mezze means sharing, tapas, flavor or seasoning. Mezze, then, in the Shukran of Casa Árabe!